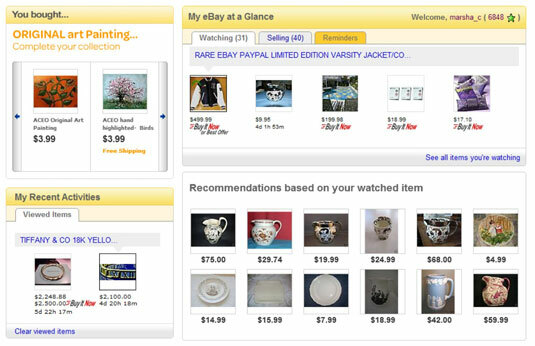 You can search eBay to quickly find items. Right below the eBay logo on the home page is a search box that helps you find items by several methods. You can type title keywords, use a drop-down list to choose categories to search, and zero in on specific items by clicking a link to eBay’s Advanced Search page. Categories: Click here for a drop-down tab showing the complete listing of top-level categories. Motors: Click this direct link to eBay Motors. Stores: Click here and go directly to eBay Stores. Daily Deal: Click here to find featured items, fun stuff such as charity auctions, and information about what else is moving on eBay. Along the left of the page, you find an expandable list of links that lead to the most popular auction categories. If you’re signed in to your eBay account when you go to the home page, you’ll see a different view. eBay presents item views — recommendations of other items you might like — based on your previous searches and items purchased. Near the bottom of the home page, notice the several other links that give you express service to key parts of the site. Here you find links to eBay’s international auction sites (a quick and easy way to shop the world), more eBay-owned sites (such as Half.com and Kijiji), eBay service areas (such as the Feedback Forum, or Gift Certificate and Gift Cards), and information and help areas (such as Announcements and the Security Center).